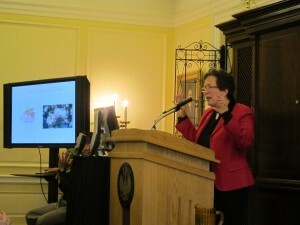 Ann’s cherry blossom talks are fun and informative for all ages. She uses lots of illustrations ranging from fine art to photographs, and covers the meaning of the trees to the Japanese, myths and tales related to them, the history of how they came to be planted around Washington’s Tidal Basin, and information about different varieties of trees today. She can tailor her talk to emphasize topics such as David Fairchild, plant explorer, and his wife, Marion “Daisy” Bell Fairchild and their roles in bringing the cherry blossom trees to Washington, and also bonsai as living works of art and diplomatic gifts. To schedule a talk, contact her at ann@annmcclellan.com. It really is splendid the way you have the whole story laid out with such good visuals for each step of the way. And your stories about the various individuals are refreshing and such good complement to the basic information which is already interesting . . . I look forward to reading through your book in my favorite chair with coffee on my next free morning. • I enjoyed the cherry blossom lecture the most as that was why I went!!!! I bought her book, very informative, well presented & great! • Ann was very knowledgeable and gave good background history and slide presentation on Japan’s gift of the cherry blossom trees. • Ms. McClellan is possibly THE authority on the festival and its background, and I noted she was acknowledged in another publication regarding her efforts on behalf of the festival. • We did enjoy the presentations by Ann McClellan & Liana Pirades [Hillwood Museum curator] who both are thoroughly knowledgeable about the topics on which they spoke.